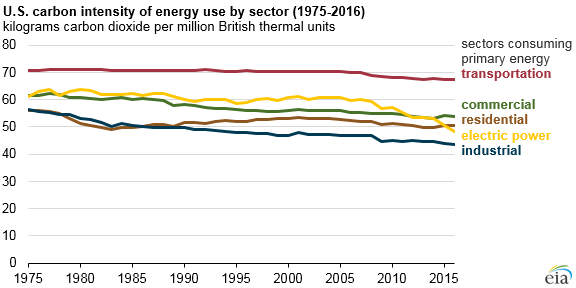 Of the five major energy-consuming sectors in the United States, the industrial sector produced the least amount of carbon dioxide (CO2) per unit of primary energy consumed in 2016, with emissions of 44 kilograms CO2 per million British thermal units (kg CO2/MMBtu). The electric power sector, previously one of the more carbon-intensive sectors, produced 48 kg CO2/MMBtu in 2016. Carbon intensities reflect the consumption-weighted average of the carbon intensities of the primary fuels consumed in each sector. Primary fuels that produce CO2 when combusted include coal, natural gas, distillate heating fuel, diesel, gasoline, and propane. These fuels have different carbon intensities, ranging from about 100 kg CO2/MMBtu for coal (depending on the coal type) to 53 kg CO2/MMBtu for natural gas. Fuels such as uranium (used in nuclear power plants) and renewable fuels (such as hydroelectric, wind, and solar) have no CO2 emissions associated with their consumption. The relatively low carbon intensity of energy use in the industrial sector is the result of several factors. The pulp and paper industry, which accounts for approximately 7% of total delivered industrial energy consumption, is a large consumer of biogenic material. EIA’s calculation of carbon intensities uses the convention that emissions from biomass combustion do not count as net energy-related CO2 emissions because biogenic fuels are produced as part of a natural cycle that absorbs carbon dioxide from the atmosphere during the growth phase. The same consideration applies to the use of biogenic fuels in other sectors, such as wood heating in the residential sector and ethanol consumption in the transportation sector. About 15% of the industrial sector’s fossil fuel use captures some carbon in the form of plastics and other non-energy products. Because this carbon is not emitted into the atmosphere in the form of CO2, it is not counted in the emissions total for the sector. The carbon intensity of the electric power sector has fallen more recently, generally because of the shift away from coal-fired electricity generation toward less-carbon-intensive natural gas and carbon-free renewable energy forms, such as wind and solar. After averaging near 60 kg CO2/MMBtu for decades, the electric power sector’s carbon intensity fell to 48 kg CO2/MMBtu in 2016. This intensity is slightly lower than that of natural gas, which produces 53 kg CO2/MMBtu. In other words, the combustion-weighted average of all fuels used to produce electricity in the United States (coal, natural gas, petroleum, nuclear, renewables) is now lower than the carbon intensity of natural gas. Because the four end-use sectors (industrial, residential, commercial, and transportation) also consume electricity, the emissions associated with electricity generation can be attributed to the end-use sectors based on each sector’s share of total electricity sales. The transportation sector consumes very little electricity, so whether or not these indirect emissions from electricity are included makes little difference in the carbon intensity. However, for the other three end-use sectors, the inclusion of indirect emissions from electricity production changes the sector’s carbon intensity. In previous years, including the indirect emissions associated with electricity production tended to increase a sector’s carbon intensity. 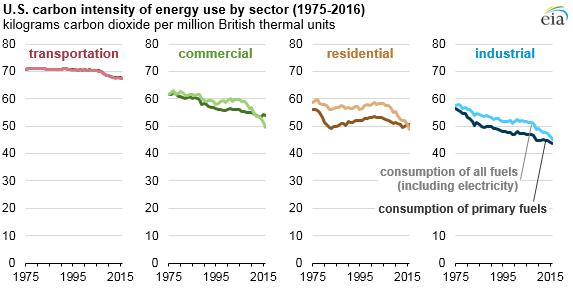 However, as the electric power sector’s carbon intensity declined, this was no longer the case for the commercial sector starting in 2012 or for the residential sector starting in 2015. 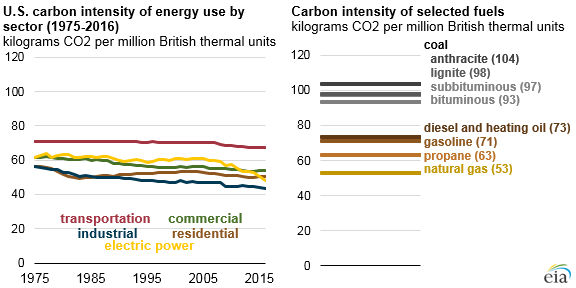 Only in the industrial sector is it still the case that including indirect emissions from the electric power sector still raises the carbon intensity of overall energy use.